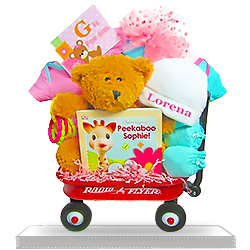 We put it all in a Radio Flyer wagon, so it's a special gift before you even look inside! This "giftwagon" was designed specifically for little boy babies. 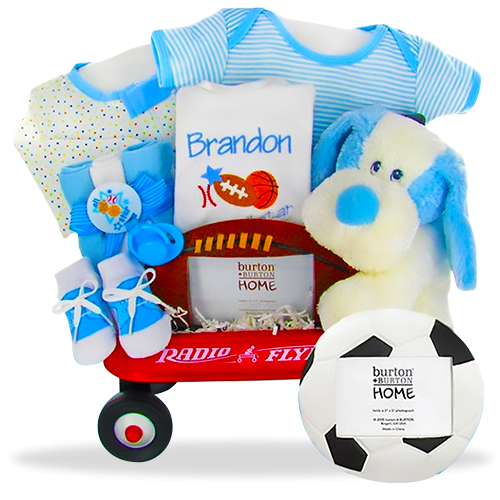 Included is baby's first puppy in adorable blue and white and your choice of sport frames. Also inside is one personalized sports bib. Clothing includes one sleep and play, a Onesie and sweet little boy booties. 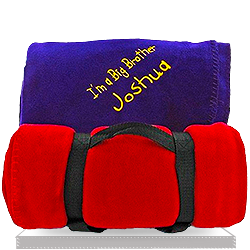 Extras include a 3 pack of baby wash cloths, and a hand pacifier clip. Delivery was great! I didn't receive the items myself, but the recipients seemed to love it. Great service. I was so impressed with the gift I ordered. 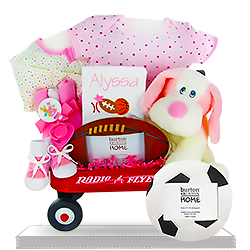 First time ordering from giftbaskets4baby and I will continue! 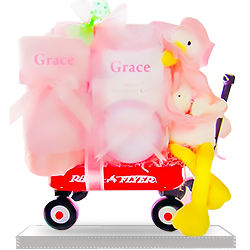 I will recommend giftbaskets4baby to everyone! Product was exactly what was expected. or all the tiimes I have used these basket, no one was ever dissappointed! Everything is perfect but I expected it will be bigger. 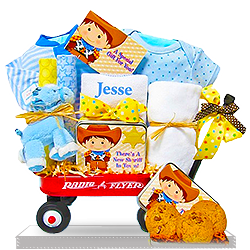 Cute and nicely designed gift for a future sportsman! Besides all these inspiring for activity great things I noticed also lovely baby clothing which is made of soft quality tissue. We were given with this for baby shower and I like it so much that probably will buy the same for someone else.